Beside the included core features, QB EzPay offers many useful reports and tools to make electronic payments easier for your organization. Anything processed using your Authorize.Net™ gateway account can be quickly viewed in transaction list and batch reports in QB EzPay. These reports can be viewed, printed, or exported to excel depending our your specific needs. 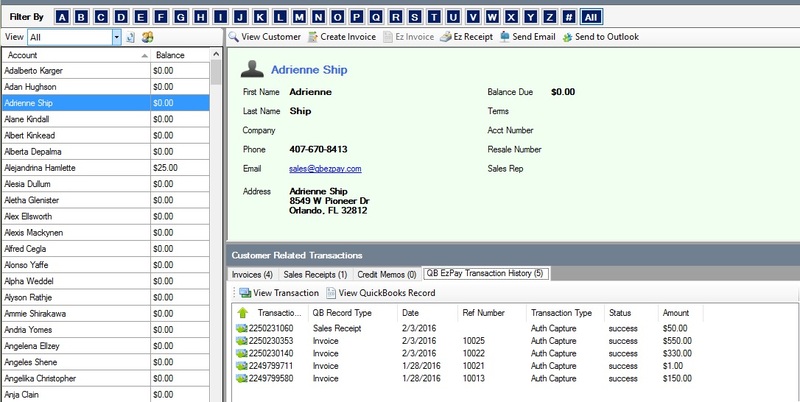 Besides reporting, the software allows you to view and manage the various payment related records in QuickBooks™ like customers, invoices, item lists, and deposits giving you added flexibility while using the software. Authorize.Net™ stores the last 2 years of transactions for you in their Reporting system. With quick access reports like Unsettled, Yesterday, Last 7 Days, Last 30 Days you can view any recent processing your organization has done. Custom reports can be run as well if you need to view transactions based on certain dates. Double-click any line item in the report and instantly see all of the specific details for that transaction including the amount, customer, payment method, taxes, shipping fee, and related line items. Batch reports give you a snapshot of what was processed on a certain day. Quickly view the type of transactions that settled – charges, refunds, and voids as well as charges by method – Visa, MasterCard, Discover, American Express and eCheck. All of the related transactions that settled that day are contained within the report as well for easy reference. 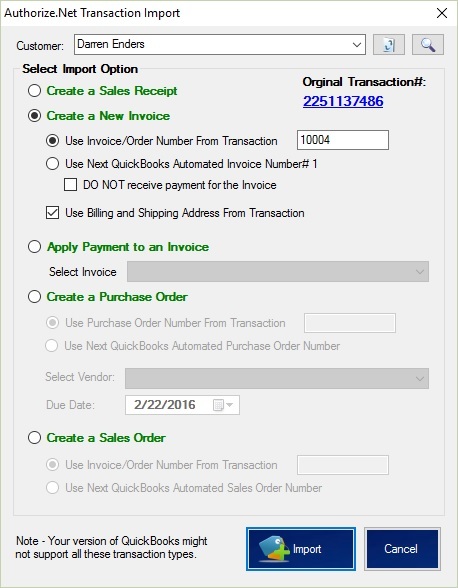 Any Authorize.Net™ transaction can be imported directly into QuickBooks™ using the Transaction Import tool in QB EzPay. Typically organizations that have an online store, processes mobile payments, or perform any other processing outside of QuickBooks™ have to manually enter these payment into the Company File or import a store orders list. Unfortunately this normally means that several extra steps need to be performed in order to receive the payment. The QB EzPay Transaction Import handles all of the steps required for you by searching for and adding the Customer record if needed and then the option of creating an invoice, sales receipt, payment, sales order, or purchase order from the transaction data. 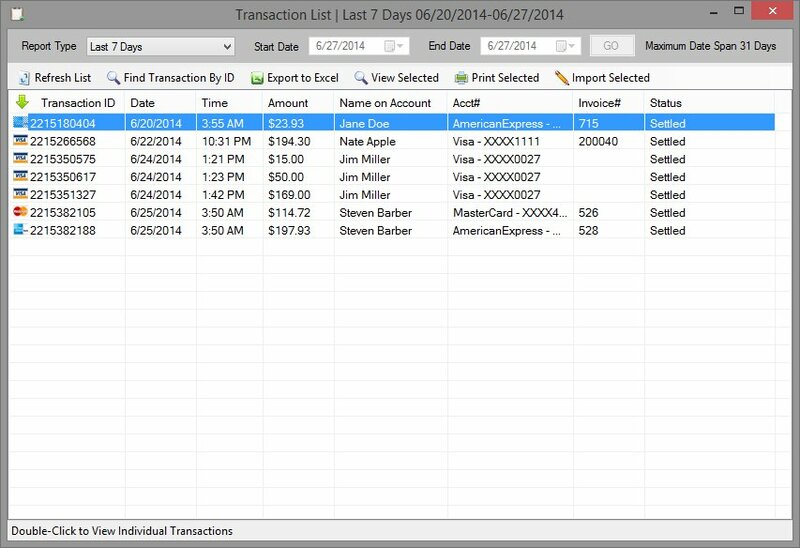 If your transactions contain line item details then they will be automatically selected as well if they exist in the QuickBooks™ items list. 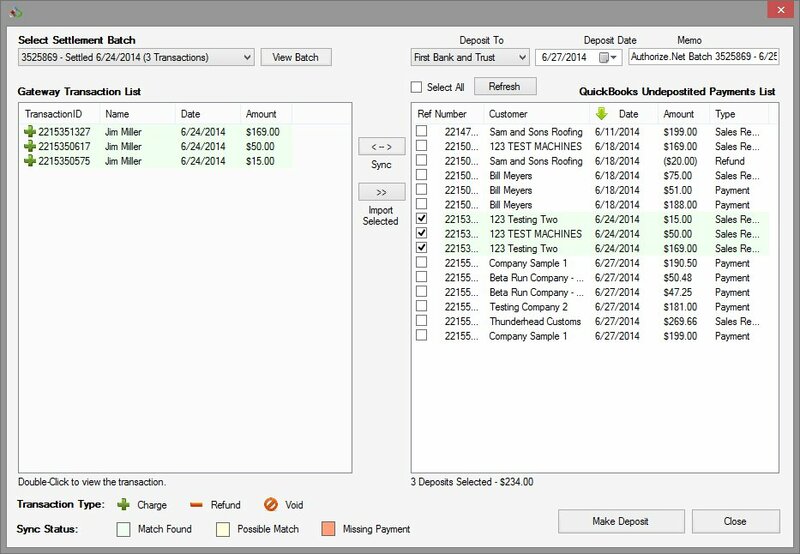 One of the most power tools contained within QB EzPay is the Reconcile Deposits feature. This option allows you to select a specific settlement batch and reconcile it to your payments waiting for deposit list within QuickBooks™. Simply click the Sync button and all of transactions processed that day are matched up to the payments recorded in your company file. Any missing or out of balance transactions are automatically found and presented to you for review. Any missing transactions can be quickly imported from the batch list as needed. Forgot to create an invoice for a customer? With the quick invoice builder you can do just that. 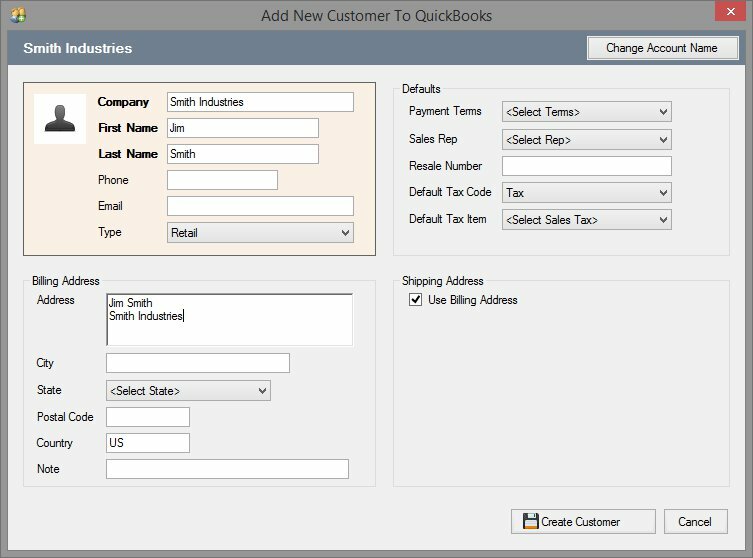 This tool was included to prevent you from having to go back into QuickBooks™ to create a simple invoice for a your customers. Select the customer, line items, and any other specific details and continue on right into EzInvoice to start the payment process. You can even add a new customer or line item if they currently don’t exist in your company file. QB EzPay includes a customer list to help you quickly access customer details, open balances and payment history. From the sortable list you can quickly create invoices, process payments for sales receipts and invoices (open balances only), send emails, and even sync their contact information to Microsoft Outlook©. New customers can be created as well. See Below. Quickly add new customers to your company file with the built in add customer form. Enter contact and company information as well as addresses and QuickBooks™ specific fields like terms, sales rep, tax information, and more. If a duplicate record is found within QuickBooks™ then you are prompted on how to proceed with the new record. 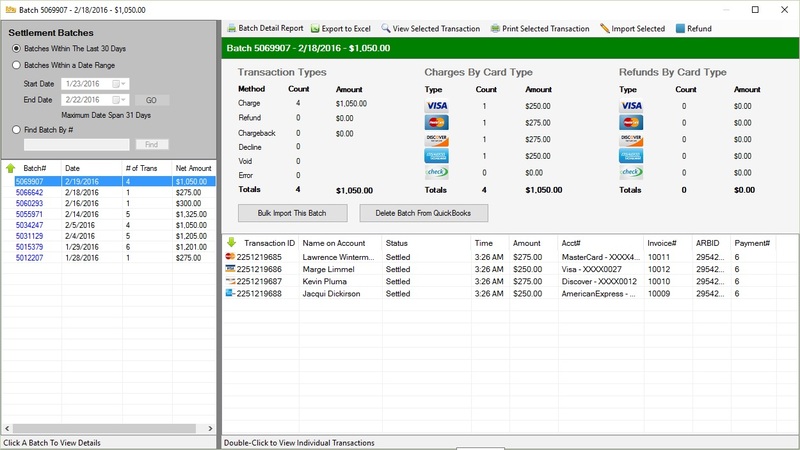 The inventory, non-inventory, service, and other charge items lists within QuickBooks™ are accessible from within QB EzPay. Quickly view any item’s details by clicking it from the sortable list. 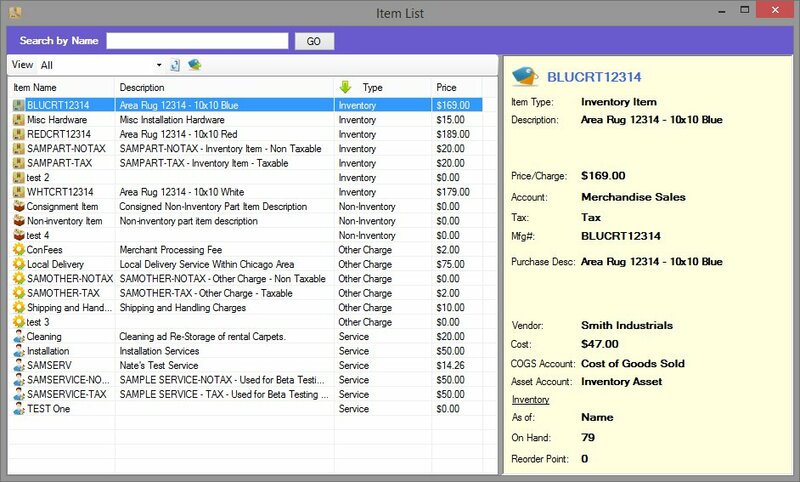 The items on these lists are used to by EzReceipt, the Invoice Builder, and any other feature that needs specific line item information. You can even add new items when needed. Have a new item to sell? 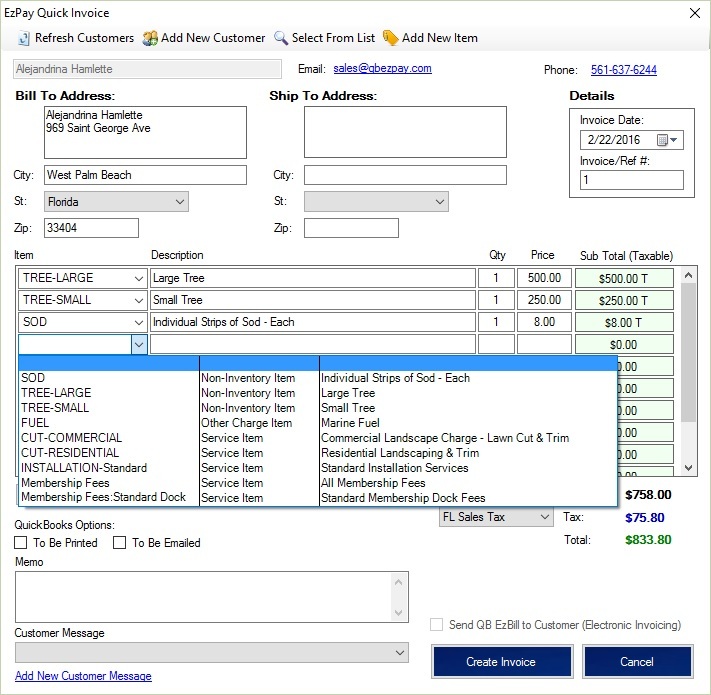 With the add item form you can quickly add an inventory, non-inventory, service, and other charge item to QuickBooks™ for use in processing within QB EzPay. 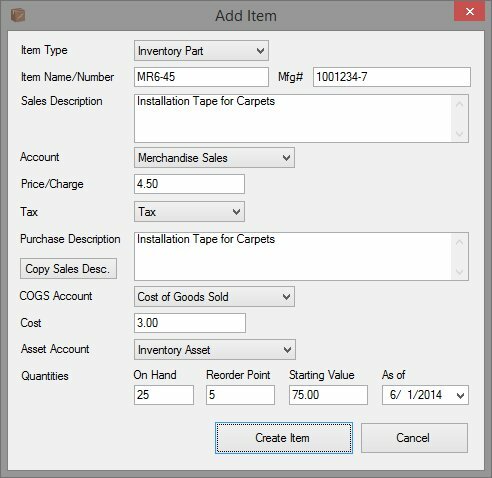 Easily select the related accounts, set amounts, specify quantities and any other required details for that item. Once added, this item will be accessible from any other form within the application that needs specific item details like EzReceipt and Transaction Import.